Mr. Holland: I doubt that you would enjoy any of the Naxos McKay discs, and I would not waste your time and money on them if I were you. I think you probably would be appalled by all three of them. However, I bet you might enjoy all three Naxos George Rochberg discs: the Violin Concerto, the Second Symphony and the Fifth Symphony. 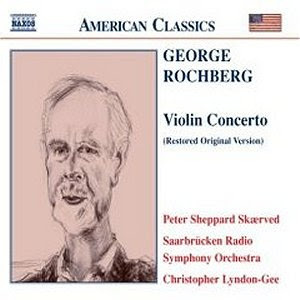 The Naxos recording of the Rochberg Violin Concerto is the original version, before Isaac Stern imposed severe cuts on the piece. The Second Symphony is serial, and very, very beautiful. I think you would love it. I am told that George Szell admired the work. The Fifth Symphony is mostly tonal, and also a very strong work. It was written for Solti and Chicago. As Philip Glass himself said: These were the factors that brought about the rise and fall of 'the twentieth century music' that became so familiar during the century's final decades, because in narrowing the field down to one that was financially supportable, it also narrowed down the musical options. Thank you Andrew for the recommendations, I'll definitely check Mr. Rochberg's music out, those pieces sound like stuff I'd enjoy. The composer has also indulged in one inside joke. As China is debating whether to accept Orchis' loan, the Angel of Bright Future appears to him in a dream, encouraging him to take the money in a siren song of harsh modernity that reaches back stylistically to Rochberg's use of atonality in the '50s. Bright Future (musical "modernism") holds out the promise of artistic redemption. But it proves to be an empty, cruel promise, best rejected. Nice! I find the tonalist/serialist battles slightly baffling from this distance, but Mr. Rochberg's story is pretty common, it seems. If the opera was done at Santa Fe, I'm sure there's a tape of it around, I'll have to check my usual bootleg sources.